I was all kitted up in my Bear Grylls gear and sturdy walking boots for this one as it was very windy but the views were beautiful and full of lush green landscapes. 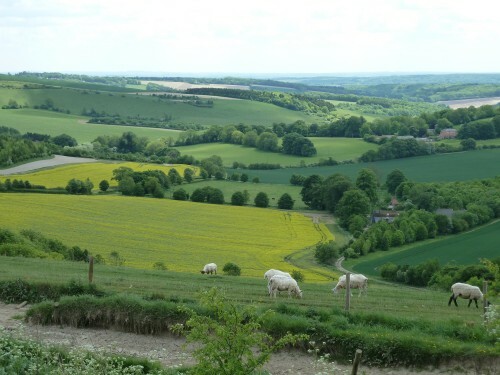 When I visited it was in late May 2010 and the weather was OK but later in the walk it did rain a bit and the views from Combe Gibbet were a little overcast… hence, no photos! This walk is 7 miles and about 3 hours worth of hard walking and I loved every minute of it. With a really sensible walking jacket and walking trousers to keep out the wind and a rucksack storing all my essentials I was ready for adventure! Heading over to the Wessex downs we found Inkpen Hill quite easily, just outside of Hungerford, and was really looking forward to a really tough walk across woodland paths, field and downland tracks, a good stretch of the Wayfarer’s Walk and plenty of farmland. The steep scarp of Inkpen Hill is an absolute killer but well worth it when you get to the top and see the views. Definitely worth while doing this walk when the weather is bright and sunny. I found this walk when I was looking on The AA’s website and thought it sounded great and really interesting. It was erected in 1676 for the purpose of gibbeting the bodies of George Broomham and Dorothy Newman and has only ever been used for them. The gibbet was placed in such a prominent location as a warning, to deter others from committing crimes. George and Dorothy were having an affair and were hanged for murdering George’s wife Martha, and their son Robert after they discovered them together on the downs. Unfortunately for the lovers, the murder was witnessed by Mad Thomas, who managed to convey what he had seen to the authorities. A replica gibbet marks the site. The original was destroyed many years ago and subsequent replicas have been replaced several times mainly, in part to vandalism. It is such a shame that such a haunted yet beautiful spot of British countryside gets ruined by idiots. I was going to copy and paste the walk and the map in to this blog but I didn’t want to get busted by The AA lawyers!